No snow gauge needed when you look out of my kitchen window. It looks like this for months each winter. In the middle of the Rocky Mountains, we get phenomenally deep, light snowfalls like the mounds shown on this spruce tree. It and the world disappear under a downy blanket. This mosaic features the novel stacked-glass method in which the white glass tesserae are piled to give a three-dimensional effect. 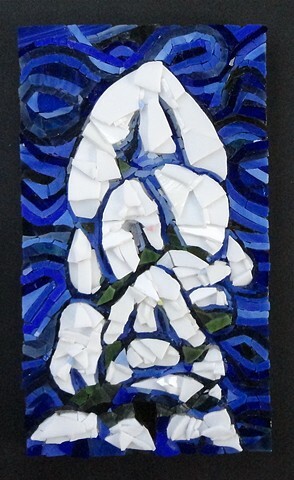 The white glass is as much as four-deep in places.The background glass is applied traditionally and ungrouted. The original drawing for this mosaic is a simple pencil sketch of a massive "dump" of snow.